Match Land (Free) by Race Cat is a match-three RPG with a twist that is rather refreshing for the genre. If you enjoyed other games such as Hero Emblems, Spellfall, Puzzle Quest, and Block Legend, then you will love what Match Land has to offer. Even though my time is consumed by Mario Kart 8 Deluxe on Nintendo Switch and trading card games lately, I still make time for my daily quick iOS gaming sessions in between everything else. While there are many genres of games on iOS, I still have my preferences, which mostly include puzzles and RPGs, so when you combine the two, I’m a total sucker for it. I’ve gone through my fair share of match-three RPGs on the App Store, but I can’t help but be drawn to them whenever a new one comes out. So when the news of Match Land hit my inbox last week, I had to check the game out for myself. Despite a few annoyances with the freemium approach, Match Land is definitely one that hard to put down, especially if you’re a big collector. 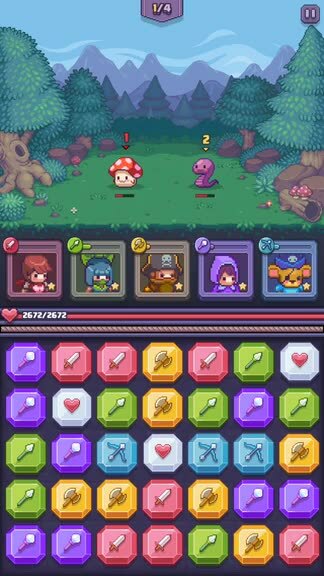 The visuals in Match Land are rather cute with a pixel art style that will remind you of the glorious days of 16-bit gaming. 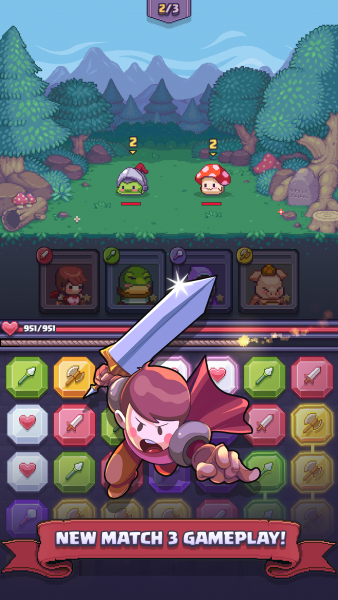 Even though the game features a pixelated aesthetic, there are more modern designs incorporated as well, which is mostly shown throughout the level selection and other menu screens. The pixel art still manages to pack in a lot of finer details though, such as textures, shading, and all heroes and enemy sprites have unique appearances that make it easy to stand apart from each other. The colors in Match Land are bright and vibrant, so it’s definitely eye-catching from a single glance. All animations are smooth and fluid, so I had no issues with lag on my iPhone 7. There’s also a rather whimsical soundtrack and fun sound effects that just make the overall experience enjoyable. I think Race Cat did an excellent job with Match Land’s visual and audio design. 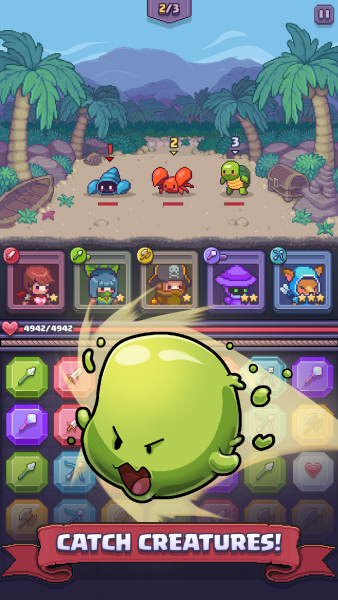 In Match Land, players will discover that it’s a match-three RPG that is not like traditional games. 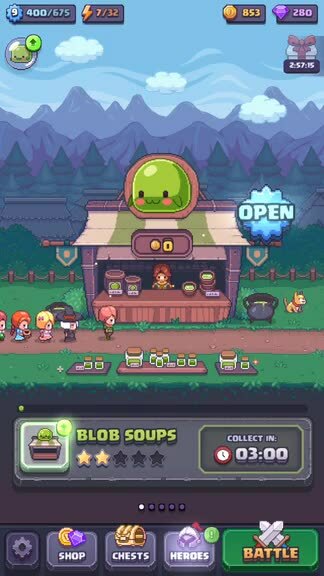 Instead, the focus in Match Land is on collecting, since you will be opening up fantasy food shops and need monster part ingredients to serve up to customers. To do this though, you need a team of heroes that are brave enough to venture forth and fight the critters needed for tasty dishes that villagers are clamoring for. 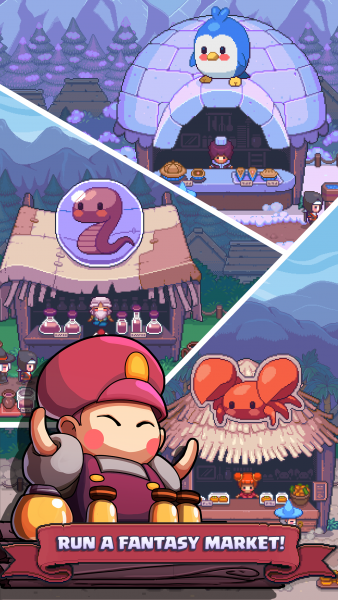 As you serve up things like blob soup, mushy buns, viper oils, and more, you’ll be able to accrue valuable gold coins for upgrading heroes and even the “evo” items that are required to evolve your heroes into more powerful versions. The game has five stages that have about five chapters in each, so there is plenty of content to go through. Each level has multiple waves of enemies for you to battle with, including boss waves, and you must clear all of the waves in order for it to be complete. Players can earn up to three stars on a level, depending on how many turns they managed to finish in (the less the better). 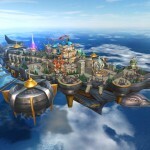 The biggest difference between Match Land and other match-three RPGs is how each turn is handled. As you’d expect, enemies will feature numbers on them, which indicate how many turns you have until that particular foe is able to attack you. However, when you swap adjacent pieces to make a match, it starts a fast countdown timer — make another match quickly to reset that countdown, and repeat the process until you can’t make any more matches or the timer runs out — all matches made in this duration counts as one turn. The countdown goes pretty fast though, which is one of my minor annoyances, so you have to plan out your moves ahead of time for combos if you want to dish out more damage, and make sure you don’t make a mistake in swaps, because it can cost you. The controls in Match Land are simple and intuitive, and if you’ve played other similar games, then it will feel natural. Like other similar titles, you can only swap adjacent pieces to make matches of at least three or more. 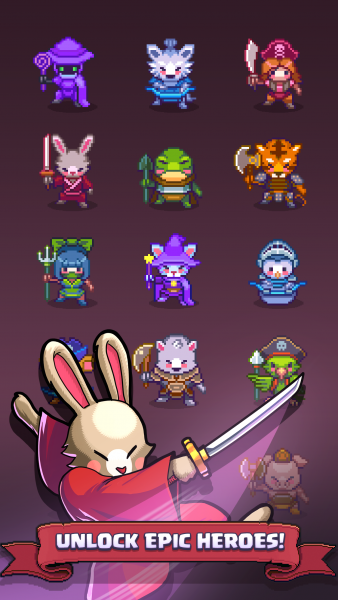 You can have up to five heroes in your critter-catching team, and each of them may be a different color. To get a hero to attack and deal damage to monsters, you have to match tiles that are their color. Depending on how big your matches are, the more damage your heroes will be able to do, and if you can rack up multiple matches in one turn (before the timer runs out), you get combos and multipliers that increase the damage dealt. This is important because you’ll want to get as many combos as possible to deal the most damage, which is the only way to get through on harder stages. Additionally, each match will slowly fill up the gauge above your hero’s portrait — once the bar is full, you’ll be able to tap on their image to activate their special ability, which are powerful attacks that you can use directly on foes. 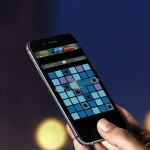 The controls in Match Land are easy to understand, but are tricky to master because of the timer mechanic. Usually, each level has three waves to fight through, but sometimes that can be more. Also, since Match Land is a freemium game, each fight takes up some stamina, with later levels costing more. You get various rewards for completing each level though, which can include gold coins, experience, spices, hero tokens, hero figurines, and even gems (premium currency) on boss stages. 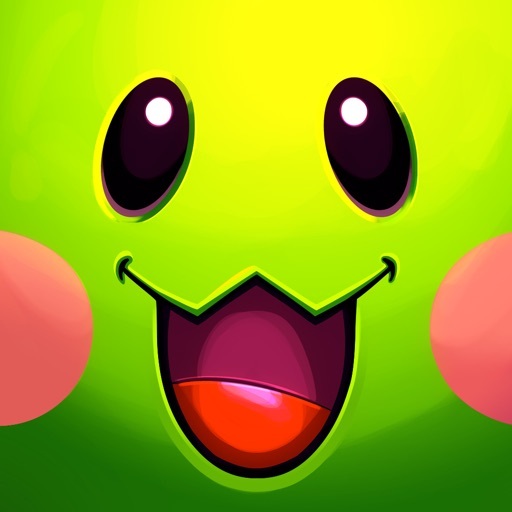 The levels that you managed to get three stars on can be “quick looted” for a stamina cost, which means that you can just collect the rewards on it again without having to play the level. 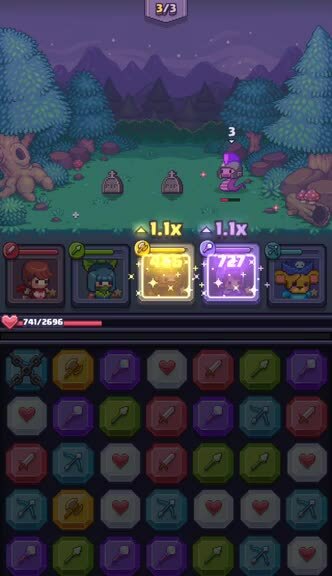 You can upgrade your hero’s power by having enough tokens (usually three at a time) and coins, or evolve them with the evos that you can gather from your food shops. The figurines are for heroes that you have to unlock, and you need to collect a certain number of them before they become available, though they’re much stronger than the heroes you start out with, so it’s worth the time and effort if you enjoy the game. Another way to get loot in Match Land is to collect keys, which you can get as rewards from some levels. You need three keys to unlock one chest, which usually gives you a nice bounty of goodies, including figurines and tokens. There are also “magical” chests that you can spend gems on instead to get even rarer figurines and more items and coins, but it will cost you a pretty penny if you don’t want to grind it out. 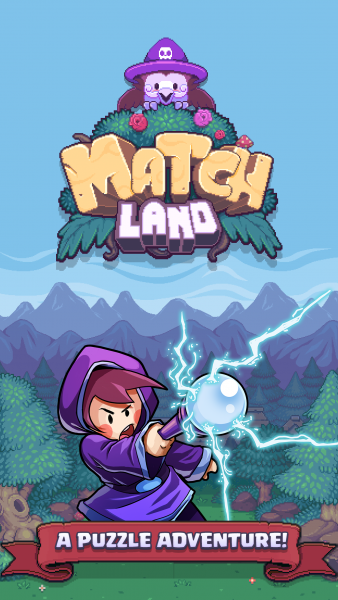 Despite the obvious push for free-to-play elements (high difficulty level after a while), I’ve been enjoying Match Land and have been playing it every day for the past week or so. I do wish that there was a way to get unlimited stamina, because I would love it if I could just play the game for as long as I want, rather than having to wait around after I’m out of energy and use up all of my refills by watching some ads. Though this would mess with the quick loot feature for 3-star levels, but honestly, I wouldn’t mind replaying stages to get the loot again if that means no silly stamina restrictions. I recommend giving Match Land a try if you are into match-three RPGs and want something that is a bit different from the norm and much more challenging. You can find Match Land on the App Store as a universal download for your iPhone and iPad for free. There are in-app purchases.